Many of us can find some sort of scar from a scrape, injury or mishap that has happened at one time or another. It would be nice if we could get by without ever having injuries but usually at some point in life something is bound to happen… and leave a mark that we wish we didn’t have. My husband has an adventurous story about when he raced my nephew up the ladder of a silo. He caught his arm on the metal ladder and it left a scar. Luckily there are amazing products like ScarAway® Scar Repair Gel that can help make scars so they are NOT the center of a conversation. The first thing that we liked is that the Gel does not have a strong smell to it and is orderless. We also liked that it does not have a color, ’cause who wants to look like they are covering up a scar and wearing makeup? More important is – who wants the Scar to be the first thing people notice? If you have a scar and prefer it NOT to be the first impression people see for you, then try ScarAway® Scar Repair Gel. ScarAway® Scar Repair Gel, featuring patented Kelo-cote® technology, carries the only patented, transparent, self-drying 100% silicone gel designed to improve the appearance of scars and prevent abnormal or excessive scar formation. 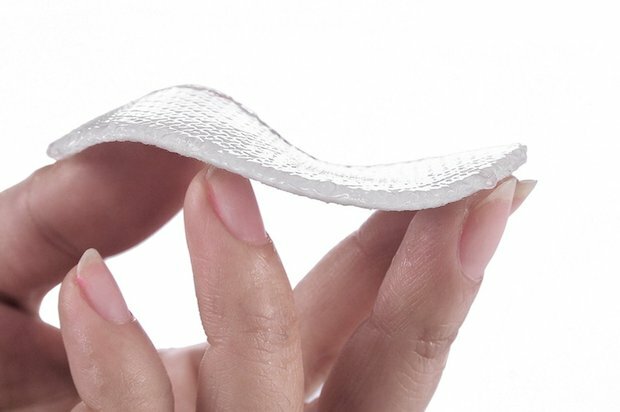 The elegant, transparent gel offers convenient application for custom scar prevention and treatment that can begin the moment a wound has healed or sutures are removed. Results can be seen in as little as two to three weeks; full results may be seen in 60-90 for new scars and 90 days or more for older scars. For the treatment and prevention of abnormal scars of various sizes and locations, including hypertrophic (red and raised) and keloid scars. Effective on old and new scars. Reader Giveaway: One lucky Jinxy Beauty winner will win ScarAway® Scar Repair Gel. To enter, just complete the entry form below by 11:59pm ET on 9/10/15. Good luck! 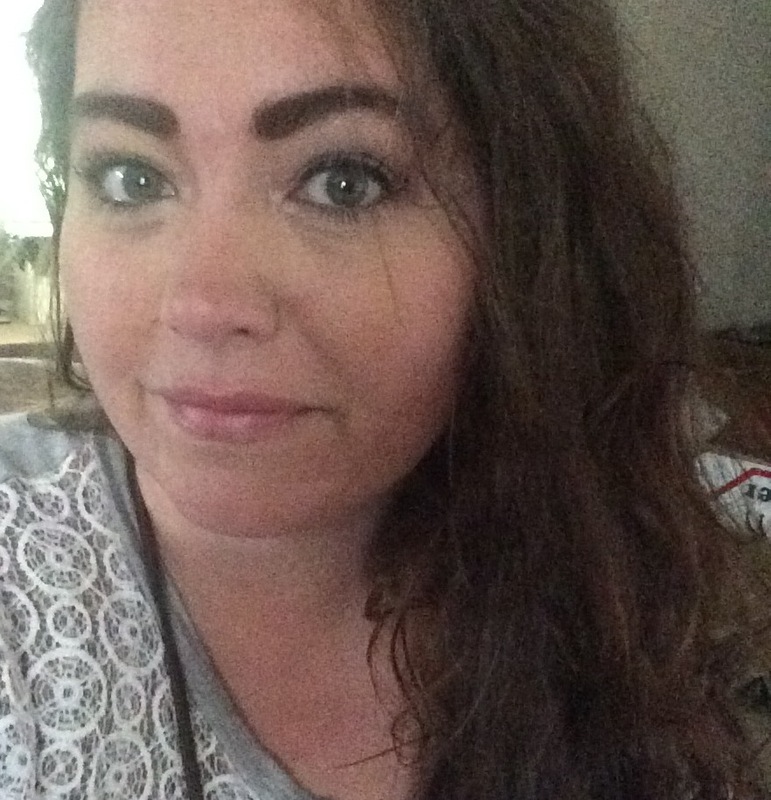 This entry was posted in Giveaway, Review, Skin Care on August 20, 2015 by Kristi. Dry skin. Hate it! 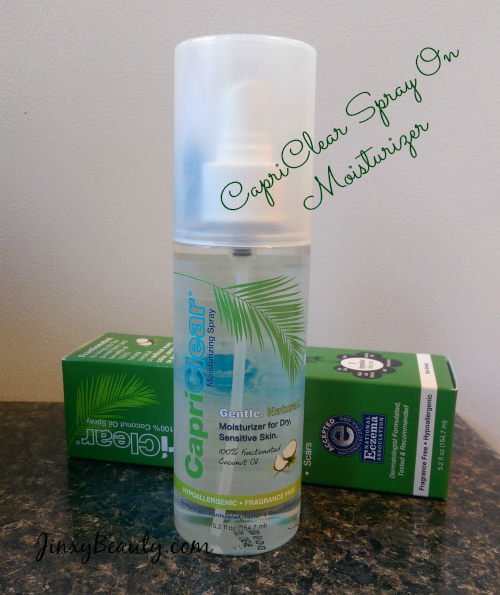 I am always open to try something new to fight dry skin and was just introduced to CapriClear Spray On Moisturizer. CapriClear is unique in that it is a 100% coconut oil spray. BUT, that coconut oil is fractionated, which means it brings you all the benefits of coconut oil in its purest form, but without scent, color, preservatives or staining. I like that CapriClear is in a convenient spray-on bottle that creates a light mist, leaving just a nice, light layer on your skin. It makes it easy to coat large areas, like your legs, in a hurry. It quickly dries and makes my skin feel soft an silky, but not greasy. It has lots of uses too. 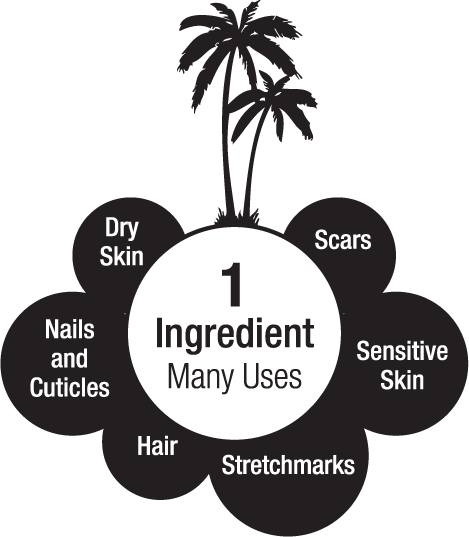 You can use it on your skin, nails and cuticles and hair. It is also good for scars and stretch marks. Reader Giveaway: One lucky Jinxy Beauty reader will win their own CapriClear Spray On Moisturizer. To enter, just complete the entry form below by 11:59pm ET on 10/8/14. Good luck! 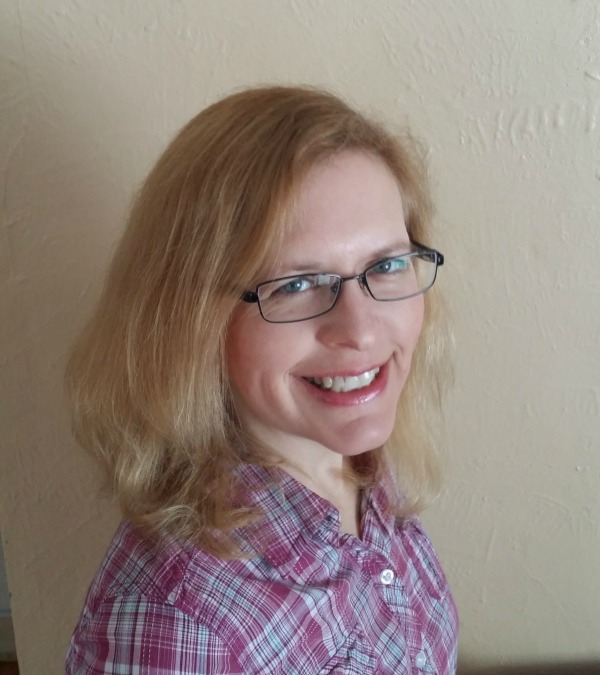 This entry was posted in Giveaway, Review, Skin Care on September 18, 2014 by Chrysa. Ahhhh…Paris. It brings to mind beautiful spring days with a stop at an outdoor cafe for a croissant or perhaps a glass of wine. It also brings to mind beautiful fashion and the latest in beauty trends. The latter is the speciality of Camille Albane Paris. 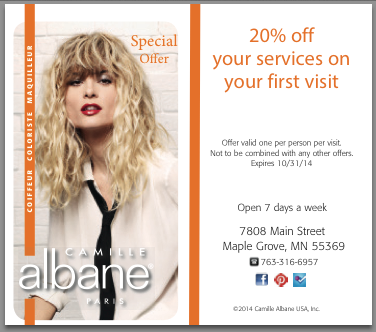 Camille Albane Paris is opening their second US location and it is right here in my backyard in Maple Grove, Minnesota. 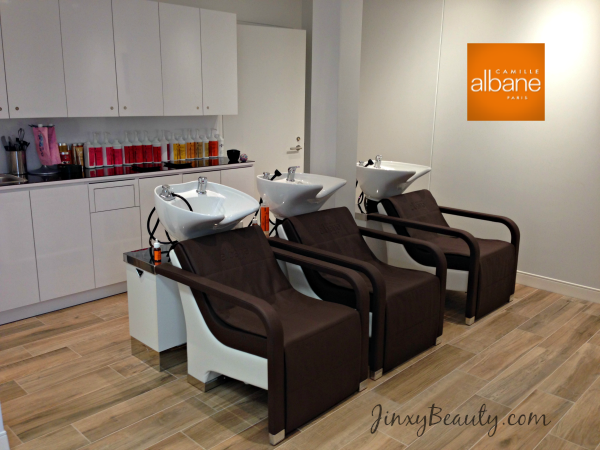 You may not be familiar with Camilla Albane, but this salon (named for its founder) started in Paris in 1994. 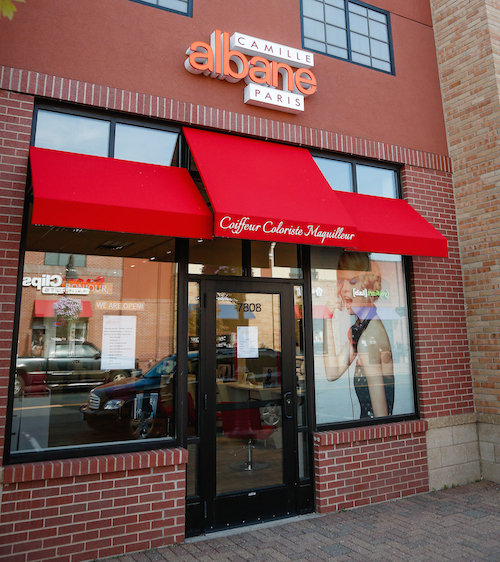 Now Camille Albane has nearly 300 salons in 11 countries. Camille Albane’s French heritage and 20 year legacy bring chic and trendy hair and makeup looks straight from Paris. They are internationally recognized for their elite expertise in styling and colouring techniques, make-up and nails. Their goal is to have their stylists collaborate to create a style that conveys each client’s personality boldly through beauty. I had a chance to visit the Maple Grove location in advance of their Grand Opening tonight. 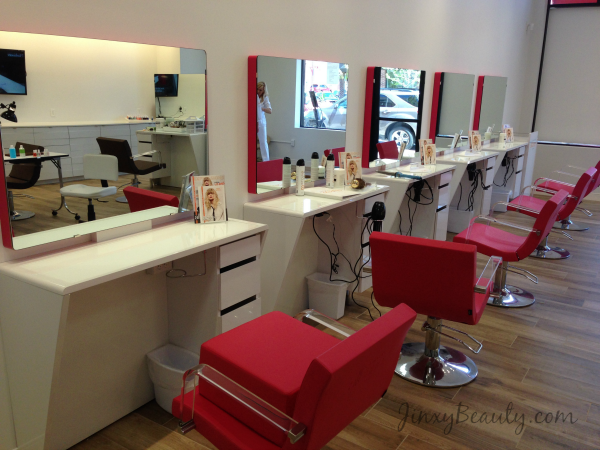 The salon itself looks amazing with it’s white base accented with pops of bright orange and red. Even the stylists are dressed in white from head to toe. I even love their shampoo chairs. Those cozy chairs not only offer adjustable footrests, but also offer massage as well – as if a nice shampoo isn’t already relaxing enough! 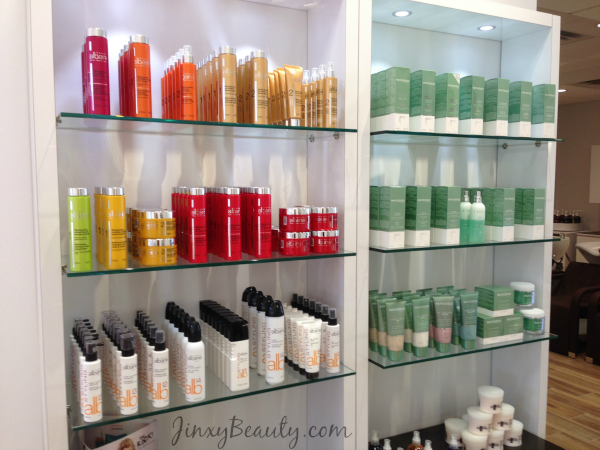 But the star of the show at Camille Albane Paris is definitely their services. 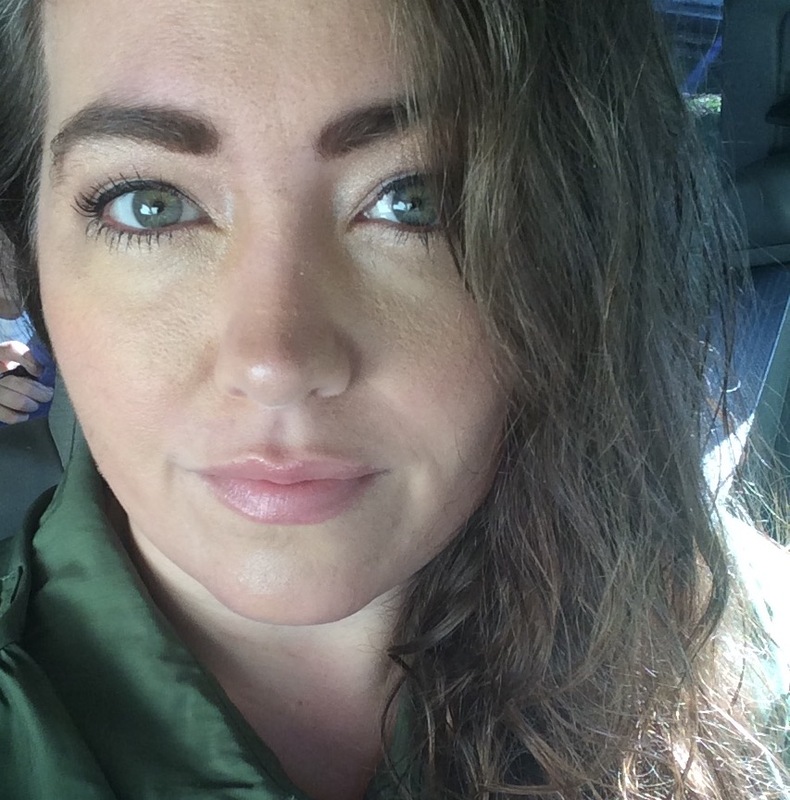 To sum it up before I even get started – I visited for a cut and color and came home to my husband saying he thinks it just may be the best cut I have ever had. My stylist, Nicole, took her time discussing my hair with me. She asked what I liked and disliked about my hair and what I WANTED it to do. I appreciated her really analyzing what would be the best for me in terms of both cut and color. I’m used to stylists using scissors to cut my hair, but all Camille Albane stylists are trained in razor haircutting, which is the salon’s signature. For the hair color, they practice balayage, which is a technique of painting the color onto the strands of hair. A nice added touch is that all stylists are also trained in makeup touch-ups, so I had a nice “put together” and complete look when I walked out of the salon. Are you ready to visit Camille Alabane Paris yourself? You can save 20% off your services with this discount card. Just print it off or show it on your phone to receive the discount. Make your appointment at 763-316-6957. This entry was posted in Hair, Review on August 13, 2014 by Chrysa. Ever notice when you have your hair blown out at the salon how quickly it dries and how great it looks afterwards? 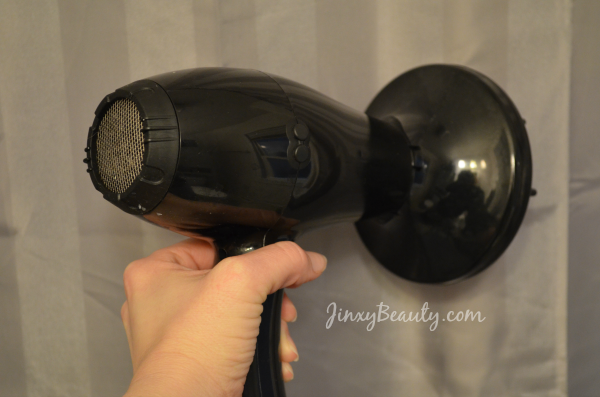 You can get the same results at home – – IF you use the right dryer! I recently received the Karmin G3 Salon Pro Hair Dryer and found out how easy this can be. 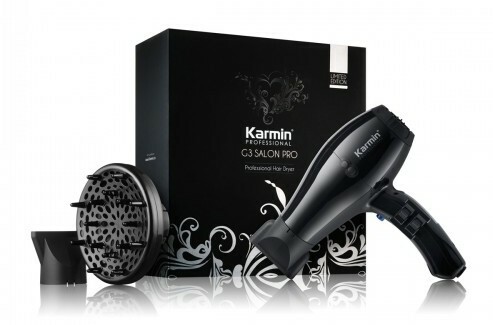 The G3 is the first hair dryer that Karmin has added to their Professional Hair Tools line. They have blown it out of the park with this one by packing it with a powerful 2000 watts, which means lots of power and fast drying. The reason it helps your hair look better is that it uses ceramic heating for healthier styling and ionic technology produces a faster drying time and emits negative ions to provide smooth, soft, shiny styling. It’s also versatile with both a diffuser AND a narrow nozzle attachment to style and design with a styling brush or other tools and focusing in on small sections of hair like your bangs. I’m loving using this dryer. My hair dries so quickly and it looks shiny and health when I’m done. I also appreciate the versatility of the 3 ways temperature and 2 ways speed settings so I can get just the performance I need. Oh, and it’s light for a powerful dyer too – under 2 pounds! This entry was posted in Hair, Review on April 27, 2014 by Chrysa. There’s no better way to feel renewed and prepared for the spring season than with fresh color for your hair. As soon as it starts hinting at a change in the season I am ready to go shopping for new clothes and freshen up my look. Getting hair color done at a salon can be PRICEY! I would much rather use that money to bolster my spring wardrobe, but I’m not always thrilled with the results of home hair color. So, I was excited to try Madison Reed, a NEW way to color your hair at home with salon quality results thanks to micro-pigment color technology. The awesomeness of Madison Reed starts right with the online ordering process. They have lots of tools to help you determine exactly what color to order. 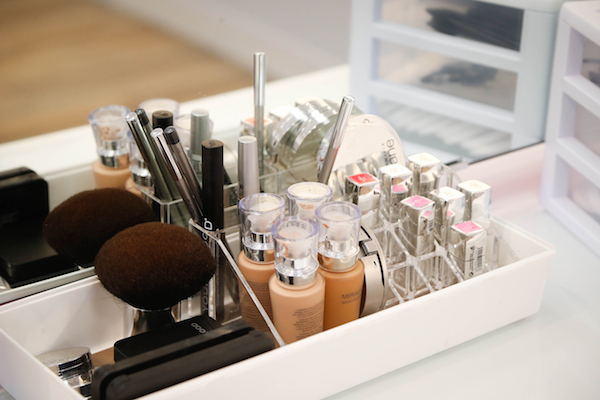 They have a Color Advisor tool that considers features such as your skin tone to find your best shade. They also have a Color Translator that can help find the Madison Reed shade that is best for you based on your current home coloring brand and shade. When the help gets really special is that they also have colorists on hand to help with your questions. You can choose to speak to them by phone, through online chat or by email. You can also send them your photo so they are able to give you answers by actually looking at you! The second part of Madison Reed that I LOVE is that their hair color is healthier for you AND for your hair. They pack it with rich nutrients like keratin, argan oil and ginseng root extract. 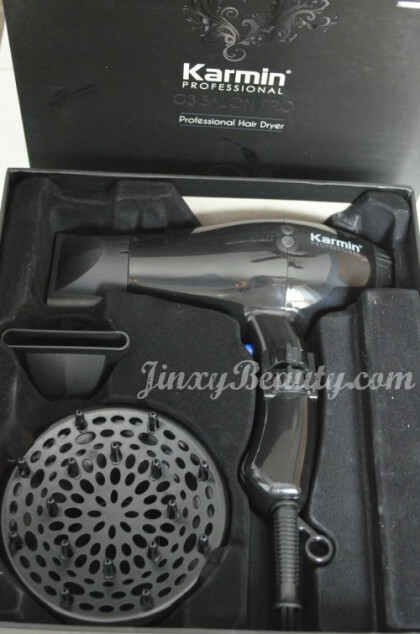 It makes your hair feel stronger and look shinier and better than before you colored. The formula has no amonia-based dyes and is also free of resorcinol, and parabens, taking the harsh out of hair color. 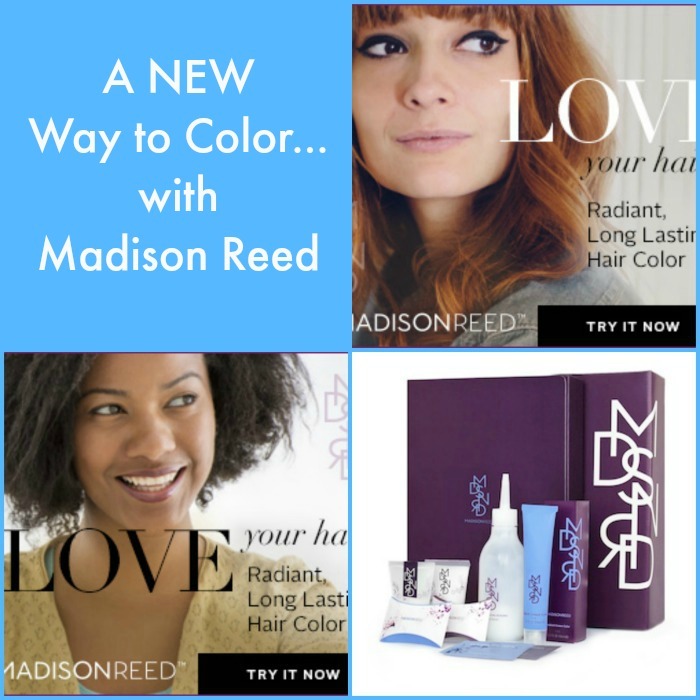 Getting the Madison Reed hair coloring kit in the mail was fun! It is packed so nicely and has every goodie you can think of to make your coloring experience a breeze. It even has Madison Reed shampoo and conditioner (which I have already sampled in the past – love them!) On to my results……. This was my BEFORE picture. As you can see my roots were giving away the fact that I haven’t been a true blonde since junior high school. And luckily you can’t see it in the picture, but there were some (gasp) gray hairs showing too! Using the Madison Reed hair color was a breeze. They include special touches not available in a drugstore color kit like barrier cream to protect your skin, cleansing wipes to take care of those “oops” spots, a protective cap and TWO pair of gloves – one for the coloring process and one for the rinsing. One of the biggest things I noticed was that there was NO overpowering chemical smell like I’m used to! It was such a pleasure to not feel like I was choking and gagging while coloring. I was also happy to know that I wouldn’t be walking around with that smell in my hair for the next day! And – my final result! I was happy with the even color – something I’m not always great about is spreading the color evenly, but it worked like a charm! And those pesky greys I mentioned, I’m happy to confirm that Madison Reed provided 100% grey hair coverage. Ready to try Madison Reed yourself? This is a GREAT time to do so because they are offering 20% off plus FREE shipping for the month of March! To get the deal, just enter promo code NEWYOU at checkout. This entry was posted in Hair, Review on March 28, 2014 by Chrysa. What is better than an awesome new dress? 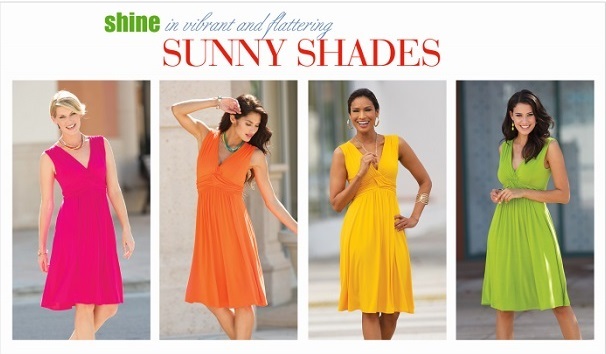 An awesome new dress that you can wear multiple ways and in all seasons! 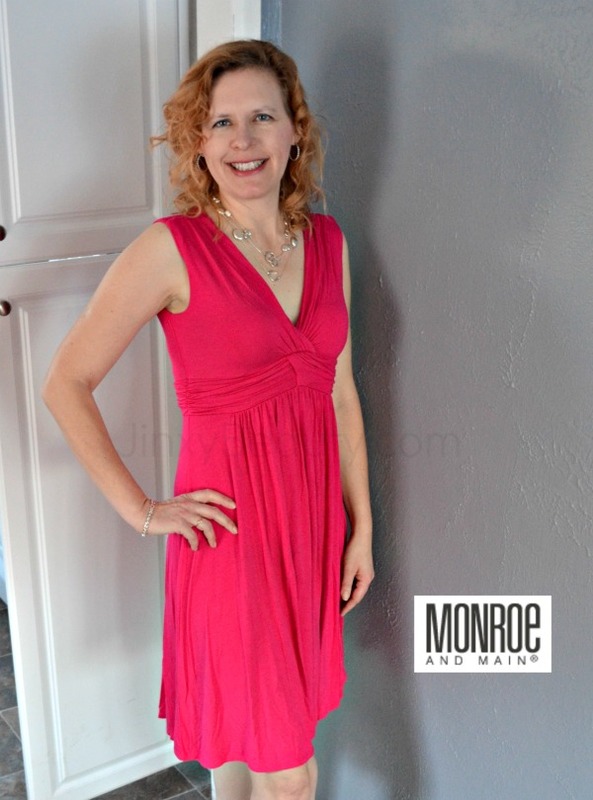 I recently received the Knot Your Mother’s Dress from Monroe and Main and, as you can see in their photo below, it really brings to mind a nice, hot summer day. Well, right now in Minnesota it is -11 and with the windchill it is something like -30. NOT SUMMER! But, guess what….it doesn’t matter. This dress can be worn spring, summer, fall or winter. All it needs is a little bit of accessorizing! First, a little more about the Monroe and Main Knot Your Mother’s Dress – – This pretty, feminine dress features an empire waist and full skirt. The knot design at the top of the empire waist adds an interesting, fun element to the design. It’s made of Rayon/Spandex, which means it can be tossed right in the washer. And it is COMFORTABLE! The fabric is no nice and soft and the fight is so comfy that it feels better than most of my nighties. I think the dress fits very true to size, or if anything maybe even a little big – so I wouldn’t recommend ordering a size any larger than you need. There is plenty of stretch in the fabric, so there is plenty of give for those times you feel you need a little more room in the fit. So whatever the season, from summer with silver strappy sandals and jewelry to the dead of winter with boots, leggings and a sweater, the Monroe and Main Knot Your Mother’s Dress is a great wardrobe go-to. Reader Giveaway: One very lucky Jinxy Beauty reader will win their own Monroe and Main Knot Your Mother’s Dress. The winner will be able to select their size and color. To enter, just complete the entry form below by 11:59pm ET on 2/12/14. Good luck! NOTE: If you don’t see the form below within 20 seconds, please click HERE to open the form in a new window. Once you have entered our giveaway, be sure to visit all of these fabulous blogs too. EACH ONE is giving away a Monroe and Main Knot Your Mother’s Dress! That’s a total of 25 dresses! This entry was posted in Fashion, Giveaway, Review on January 28, 2014 by Chrysa. I love the put-together look that a high-quality blouse can give to almost any outfit, whether it’s paired with jeans, a skirt – or whatever! It provides a classic touch and makes it look like you spent time choosing your outfit before you ran out of the house, even if you truthfully only spent two minutes getting dressed. Unfortunately, I never seem to have an easy time of finding a blouse that I like – one that looks good, feels good and is easy to care for. When Foxcroft asked me to try one of theirs, I jumped at the chance. A new blouse and not even having to go to the store to pick it out?? Well of course!! I spent some time browsing through the many many choices at FoxcroftCollection.com. I finally decided on the Essential Stretch Fitted Roll Tab Non-Iron Blouse. It was hard to narrow it down to just one color, but I chose the True Blue. This non-iron blouse features roll-tab sleeves that can be worn either long or rolled to the elbow. It has a point collar, open neck and shirttail hem with side slits. It’s made of 97%Cotton/3%Spandex. I love this shirt!! I took it with me on our recent vacation to Florida to give it a trial run. Even after being crumpled up in a suitcase, after a day of hanging on a hanger it looked good enough to wear WITHOUT IRONING! The fitted cut of the shirt makes it very flattering. I hate a blouse that makes me look boxy and this one does NOT do that at all. The fabric is also very comfortable and the cut is fitted, but well-proportioned so that I could move easily and freely. It’s the perfect new shirt to wear with jeans, with a skirt, with dress pants, with a nice pair of white capris, etc. etc. etc.!! 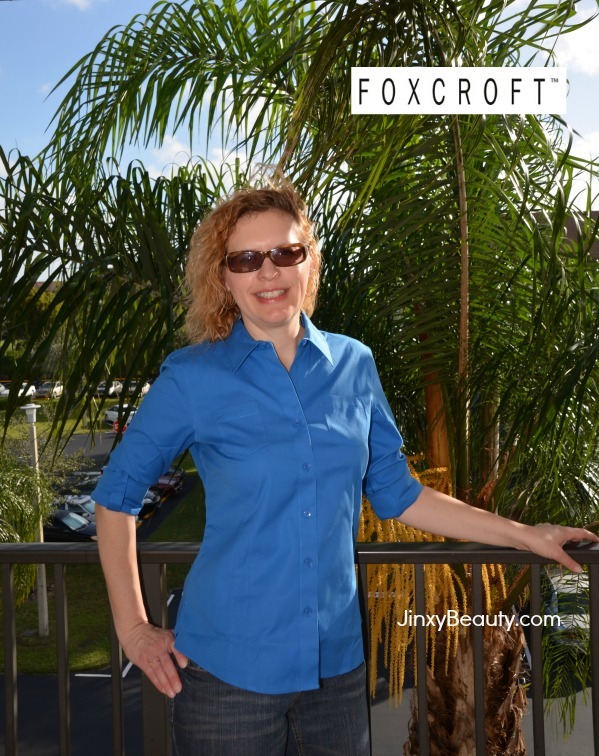 The next time I’m in a rush to put together an outfit to go to dinner with friends or an afternoon meeting, I will happily reach for my new Foxcroft blouse! Disclosure: I have been compensated for this post. All thoughts and opinions are my own. This entry was posted in Fashion, Review on December 30, 2013 by Chrysa. The Softest Infinity Scarf – Boston Infinity Scarf Review + 40% Off Coupon Code! 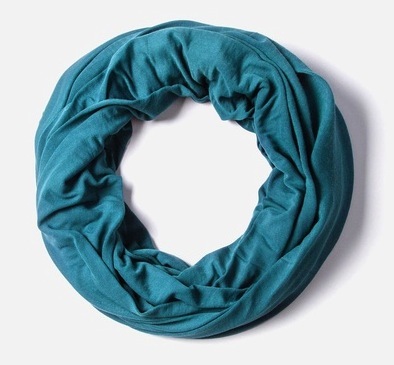 I’ll be perfectly honest and say I’m not a big fan of the ongoing infinity scarf trend – especially in warm weather. That being said, I recently received the Boston Infinity Scarf from Scarves.com and I love it. We have definitely hit the cold weather season here and I get cold very easily. I love a scarf to give me some extra warmth, especially one I can easily pull up over my head to block the wind. On the other hand, I don’t want the scarf to be very restrictive and I don’t want the scarf to totally ruin my hair once I take it off again. The Boston Infinity Scarf is a great answer to all these situations. It is made of SUPER SOFT fabric that is also very lightweight. It gives just the right amount of warmth without weighing you down. Also, since the fabric is so light, I can pull the scarf over my head for protection, but still have my hair looking good once I remove it. I also like that the edge is unfinished, so the scarf falls into a nice, natural looking roll. I have been wearing my scarf so much lately that I’m starting to feel chilly whenever I don’t have it on! Time for me to stock up on more colors! The Boston Infinity Scarf is available in 20 different colors and is only $18. Scarves.com offers free shipping on orders of $50 or more, so order a few different colors either for yourself or to share as gifts. COUPON CODE: Through 12/7 you can save 40% off the Boston Infinity Scarf or any product from Boston Infinity Scarf when you enter coupon code SCYBER40 at checkout. 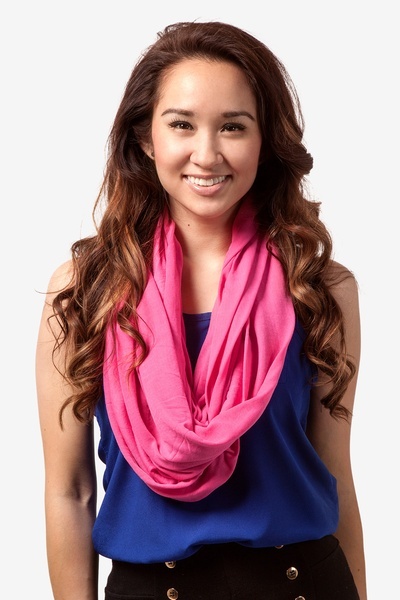 That makes this scarf a steal at only $10.80! 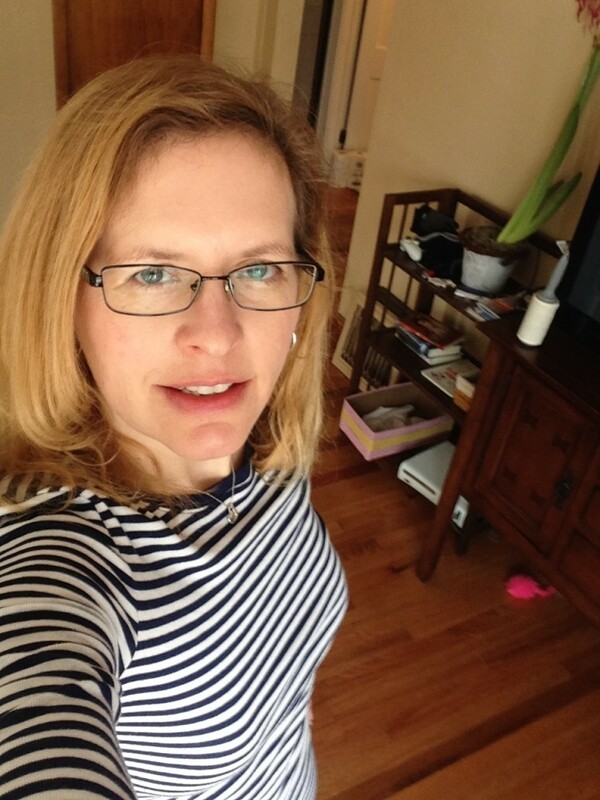 This entry was posted in Accessories, Review on December 3, 2013 by Chrysa. 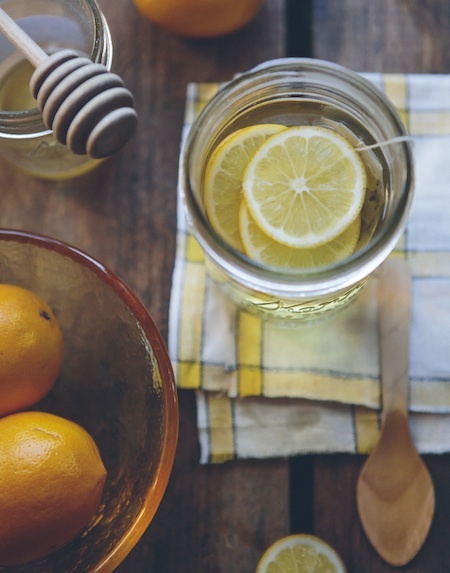 If you’re careful about what you put into your body, you’ll also want to take care with what you put ON your face. All face masks are not created equally! 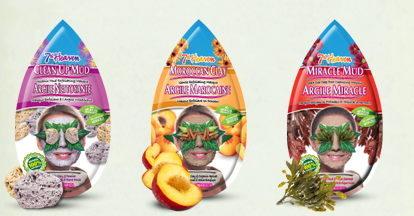 I recently had the opportunity to try 7th Heaven Face Masques, created by a vegetarian guru who has spent over 25 years traveling all over the world to find and pure natural ingredients to include in these awesome masks. The masks are made with specially sourced clays and muds to help remove dead skin cells from your skin surface that cause dullness, clogged pores, and imperfections. The deep pore cleansing reveals a more radiant, smooth, and healthy looking skin. 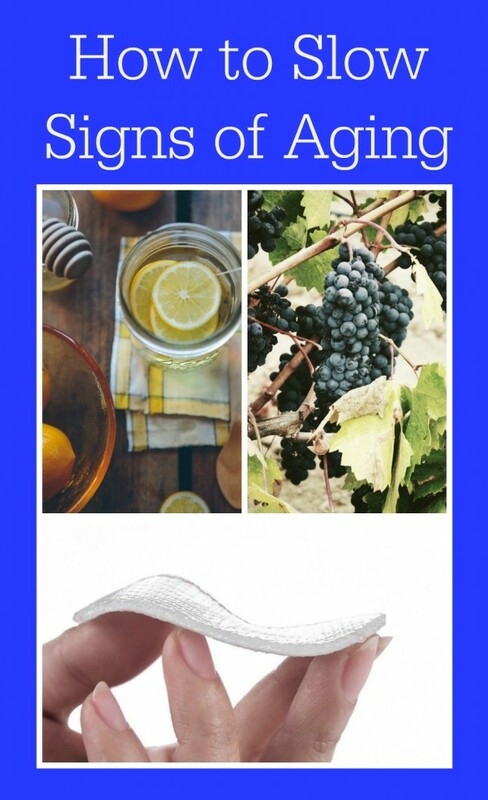 Best of all, you use them right and home and can see instant results in only 15 minutes! The 7th Heaven Masque that I was first to try was the Million Year Mud Revitalising Face Masque. It is made with Rhassoul mud, which spent a million years absorbing goodness. Other ingredients in the mask include Organic Clove, Organic Ginseng, Organic Juniper and Organic Shea Butter. It’s suitable for many different facial types – even combination dry/oily. 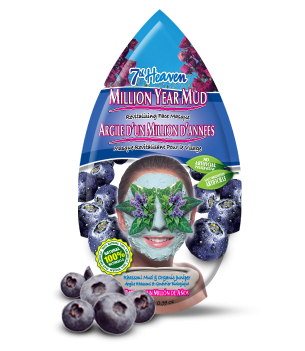 Using the Million Year Mud Revitalising Face Masque was a refreshing experience. Right out of the package, it has a GREAT scent. I put it on my face about 20 minutes before my shower. While it was sitting on my face it seemed like I could just feel it sucking the gunk out of my face (of course that could have been my imagination – but I liked the thought!) After rinsing it off and getting out of the shower I was very happy with how soft and smooth my face felt. 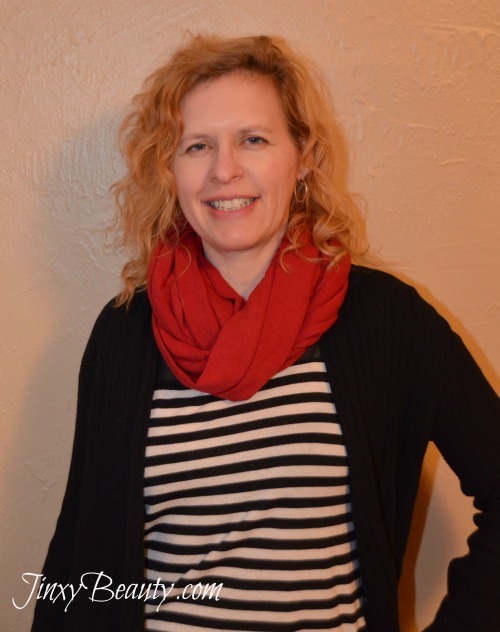 My completion looked more “fresh” and even my husband noticed it – now THAT is an accomplishment! All 7th Heaven products are natural, vegetarian certified, fair trade, have no artificial preservatives and are not tested on animals (this includes the raw materials and finished product). …..and I almost forgot one of the best parts….each mask is only $2.99! Just try finding a salon facial for that price! 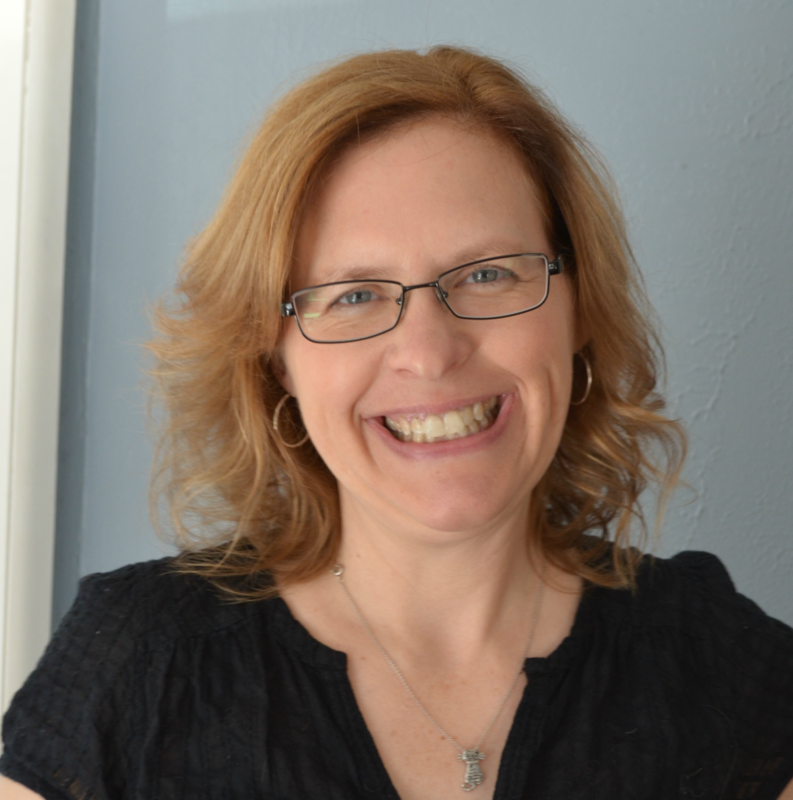 This entry was posted in Review, Skin Care on November 20, 2013 by Chrysa.